The Fire Clownfish is orange to red in coloration. Early juvenile fish have 1-3 white stripes on the head and body. However, as the fish grow these stripes disappear and adult fish have no stripes. The posterior part of the body will develop a dark coloration as the fish grow and mature, which can have the appearance of a saddle (hence it’s other common name Red Saddleback). Special note – copper intolerant! Fire Clownfish are different from other clownfish when it comes to being intolerant to copper exposure. Copper is commonly used as a medication for protozoan parasites. However, Fire Clownfish does not tolerate copper exposure and different treatment options should be used for this species if treating for parasites. The Fire Clownfish can be found in the Western Pacific including Sumatra, Java, Malaysia and Thailand. Fire Clownfish grow to a large size and often become a dominant species in aquariums. Though they will defend their territory with vigor they will peacefully coexist with most species of fish not belonging to the clownfish family. Fire Clownfish are hardy and bold and are a good clownfish for beginner aquarists. Most clownfish are omnivorous feeders, meaning that they will consume a variety of different food types. In nature the diet of clownfish consists of crustaceans (such as copepods and amphipods), algae, polychaete worms and leftovers from the anemone’s meal. 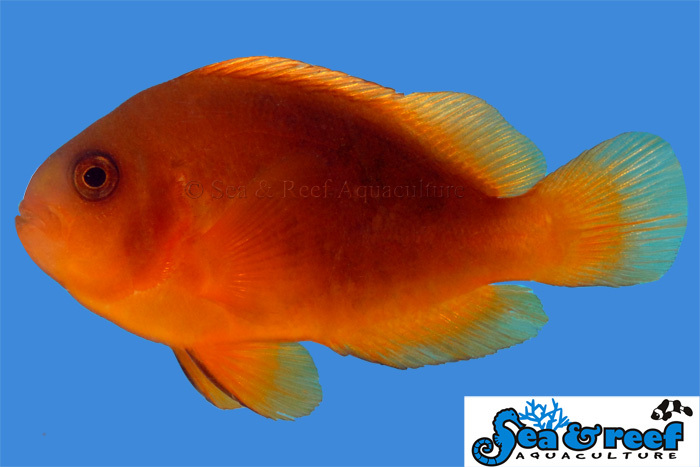 Our captive bred fish are conditioned to eat a variety of aquarium diets including pellets, flake food, frozen Mysis shrimp, and frozen brine shrimp. Natural host anemones for Fire Clownfish include the Bubble Tip Anemone (Entacmaea quadricolor) and the Sebae Anemone (Heteractis crispa).